If you had to market a final season premiere of a TV cult classic that wouldn't appear on television, how would you do it? With billboards, print ads, and primetime slots on TV? Probably not. You’d have to buckle down and get creative to reach such a niche, digital audience. Well, that’s exactly what Arrested Development did. After Netflix brought the show back to life for a final season that would only be available through the Netflix streaming service, the show launched one of the most creative integrated inbound marketing campaigns we’ve ever seen, using content across multiple channels to target the show’s core viewer demographic -- young, sarcastic internet junkies who love smart humor. The campaign is not only hilarious and brilliantly executed, but it also focuses on one of the main components of inbound marketing: content. This content -- online and offline -- is aligned perfectly with the show's target audience. It doesn’t interrupt people; it delights them. The campaign is creative and clever -- each piece pulling you further down the funnel to the final point of conversion: watching Arrested Development on May 26. To show you why this campaign is just so darn awesome and lovable, we gathered the best parts in one place. As a truly integrated inbound marketing campaign, there are a ton of moving parts -- so we’ve grouped them into three main themes. P.S. If you aren't familiar with Arrested Development humor, it certainly isn't PG. Some screenshots bely such humor. Tobias Fünke is one of the show’s most colorful characters. A former doctor turned struggling actor, he often peppers his speech with unintentional double entendres. 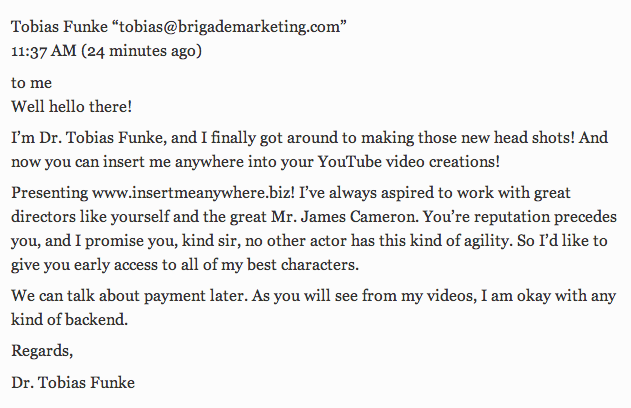 This part of the campaign brings Tobias Fünke to life under the premise that he’s trying to get James Cameron to cast him in a movie. 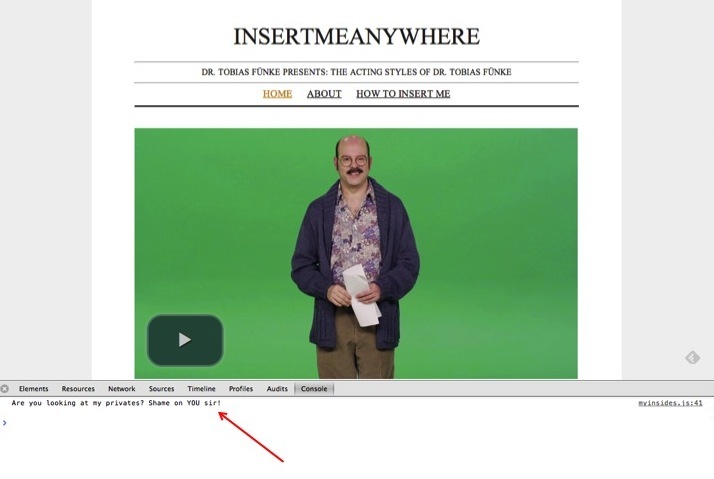 This website is Tobias’ audition reel with a twist -- he’s recorded and photographed himself in front of a green screen, so all James Cameron (or any other director) would have to do is “insert him anywhere” within a movie. Choose one of his “characters” and then download the videos and photos to use for yourself. This type of interactive content is exactly what the Arrested Development fans love. 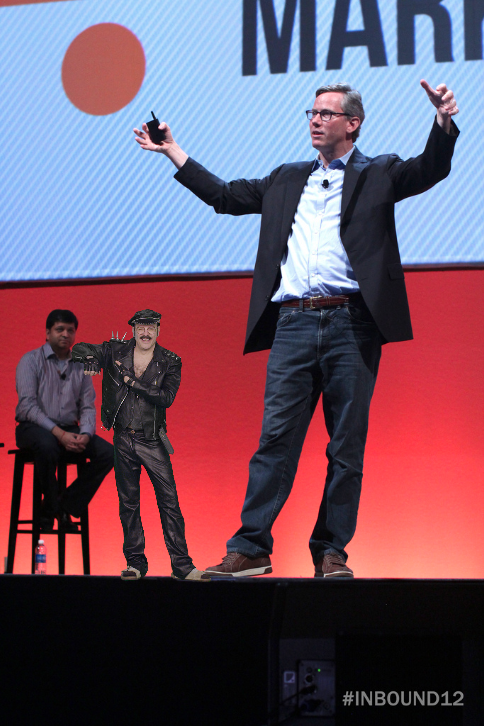 We had to try it, too: Check out Tobias with HubSpot co-founders Brian and Dharmesh on stage at last year's INBOUND conference! Among all the hilarious content on the site, there is one hidden gem that makes the site even more realistic -- the ManGo Juice ad at the bottom. At first glance, it seems like just another spammy banner ad, but when you click on it, you're taken to another site featuring Tobias in one of his acting roles. Thought we were done? Not just yet. There's one more surprise on these websites. If you open up your browser’s console (right click, choose 'Inspect Element,' and then click 'Console' from the navigation) to look at both sites' code, you’ll see quotes from Tobias -- an Easter egg that a true fan would find and love. We love this letter because it wasn’t a “spray and pray approach” -- it used creative content to delight journalists. To round out the campaign, the marketing team also posted the website on the Arrested Development subreddit on behalf of Tobias. Besides this post, Tobias also had a history of posting to other subreddits, which further brought his character to life. Reddit loved it. And considering Reddit is a notoriously hard community to please – blatant self-promotion is one of the biggest no-no's of the site -- this was an extraordinary feat for the marketing team. 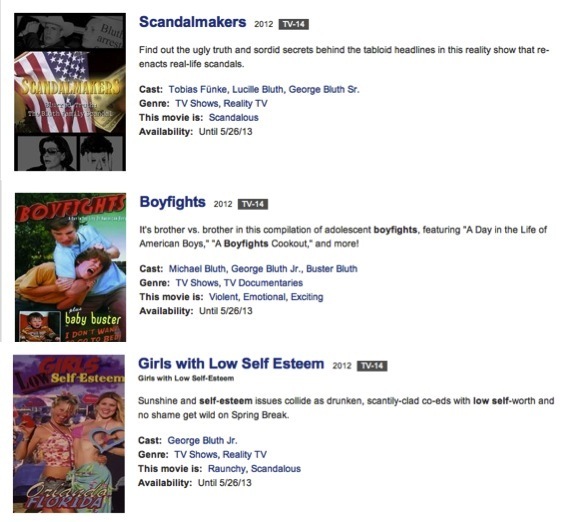 Within the plot, the Arrested Development characters often reference fictional TV shows such as Girls with Low Self Esteem, Scandalmakers, and Boyfights. So, Netflix created listings for each show that appear among the rest of Netflix's real listings. Normally, Netflix ratings take the shape of a star. But for Arrested Development, they are shaped like bananas -- referencing the much-beloved Bluth banana stand from the show. One of the first Easter eggs Netflix created appears when you search for a show or movie with the word “blue” in it. On the right side of the screen, you’ll notice blue handprints and smears, which references one of the top recurring jokes revolving around Tobias painting himself blue to audition for The Blue Man Group. Last but not least, Netflix features a little yellow bowtie in the footer of every page -- referencing Buster’s accident from a seal with a yellow bowtie. We especially love that the bowtie appears across the entire site, allowing more fans to actually discover the Easter egg. Arrested Development toured the world with Bluth’s Original Frozen Bananas stand and the Bluth Company stair car to bring the TV show to life. Fans could take pictures with Arrested Development stars and some of the show’s most famous props, and then continue the conversation online with the hashtag, #ADWorldTour. What rabid fan wouldn’t want a picture with the most famous props in the show? The team also embraced visual content for a real world and online event. Arrested Development placed nine print posters all over New York City -- one for each of the show’s characters -- and then asked its fans to find them. If a fan could find all nine posters, snap a picture, then tag them on Twitter or Instagram with the hashtag #BluthHunt, a tenth poster would be released online. We love how this promo integrates both online and offline tactics, so both local and global fans could benefit. Of all the promotions the Arrested Development marketing team launched, this is one of the coolest. 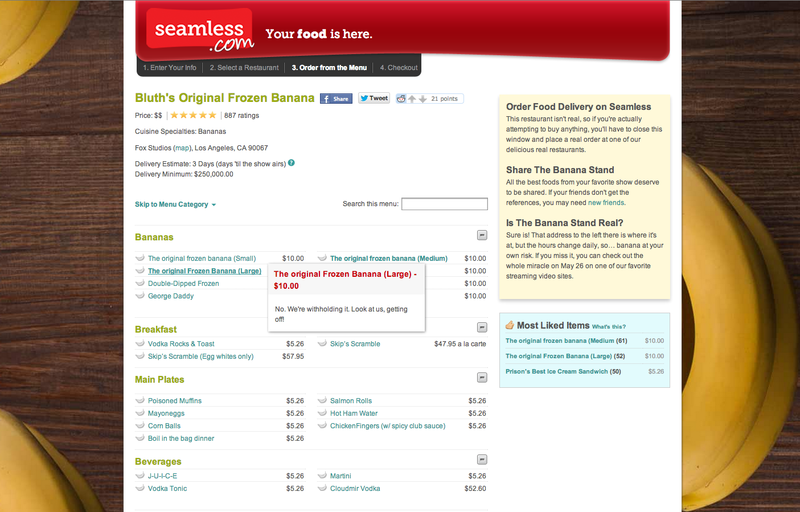 The team created a fake Seamless.com account for Bluth’s Original Frozen Bananas -- each item specifically referencing a joke within the show. Unfortunately, you can’t actually order anything, but at least the “out of stock” copy is a hilarious reference to the show as well! We especially love this part of the campaign, because it shows there are so many ways to use creative content online. Sunday will be the test -- will this creative inbound marketing campaign pay off? We’ll just have to wait and see. If all else fails, Arrested Development can take solace in the fact that there’s always money in the banana stand. 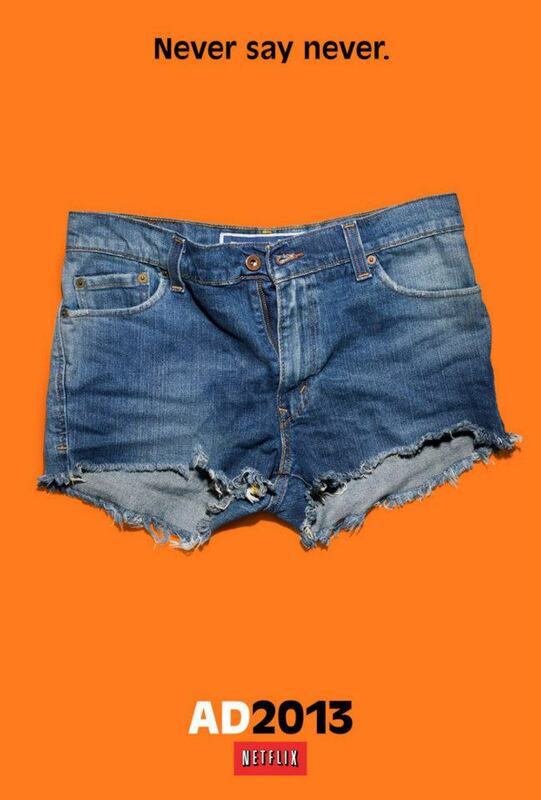 What do you think of Arrested Development's marketing campaign? How would you make it even better?